The North American Electric Reliability Corporation's (NERC) recently released 2014-15 Winter Reliability Assessment finds that all assessment areas have enough capacity resources to meet normal winter peak electricity demand. However, NERC highlights lower levels of reserves (spare capacity) in specific regions under an extreme winter scenario where the combination of demand increases and supply outages may stress electricity grids. NERC also discusses concerns about fuel diversity, specifically highlighting high dependence on natural gas-fired generation in certain regions. Under the assumption of a normal winter, NERC projects the contiguous United States will have adequate resources to meet peak demand. The anticipated reserve margin (the difference between total anticipated supply resources and projected peak load, expressed as a percentage of total load) ranges from 20% in the Northwest (WECC-Northwest Power Pool) to 85% in the lower Midwest (specifically, SPP power system). Grid reliability is usually a larger concern in the summer, when warm temperatures increase the need for electric air conditioning. But winter conditions can also pose challenges to grid operators: unusually rapid increases in electricity demand, demand peaks in the morning rather than in the afternoon, and high levels of demand in the evening. A critical difference compared to summer conditions is that cold weather can reduce the availability of fuel for generators. Very cold conditions can cause mechanical failures on rail and pipeline systems, disrupting the delivery of coal and natural gas. During cold weather, the increased amount of natural gas required to serve high-priority residential and commercial heating loads may interact with capacity constraints on total natural gas deliverability to limit the supply of natural gas to power plants. In such circumstances, natural gas-fired plants must either reduce output or (if possible) rely on other fuels such as fuel oil. Finally, power generating units themselves can fail during very cold weather. Last winter's extremely cold weather had substantial effects on electricity demand, particularly in the Midwest and eastern United States. Several locations in the Eastern Interconnection set winter peak demand records in early January 2014. To examine the effect of another extreme winter, NERC analyzed the power systems most affected last year using a similar supply and demand scenario. NERC estimates that available capacity in the MISO power system across much of the Midwest could fall from 144 gigawatts (GW) to 121 GW during an extreme winter, reflecting generator outages resulting from inoperable equipment and unavailability of fuel. These supply outages, combined with higher cold-weather loads, would reduce the MISO reserve margin from the baseline estimate of 43% to 12%. 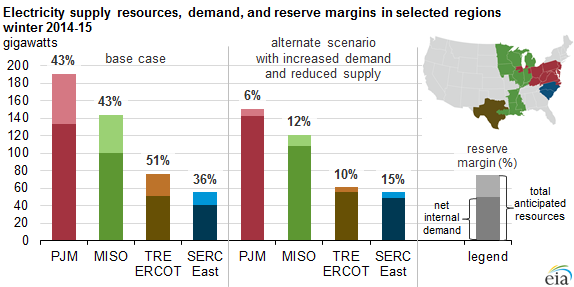 Similarly, reserve margins in PJM (across the mid-Atlantic area) and ERCOT (much of Texas) could fall from 43% to 6% and from 51% to 10%, respectively. The eastern SERC area could also see reduced reserve margins (from 36% to 15%), mostly because of higher load levels under extreme winter weather. Although margins in this scenario are much smaller, they are still high enough to ensure grid reliability. Reliance on natural gas for power generation highlights another issue of increasing concern for grid operators in the Northeast, particularly in New England. 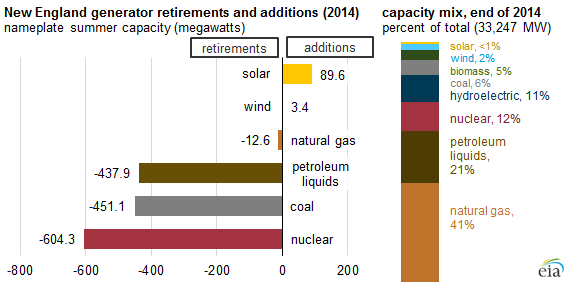 This winter, New England will have a greater reliance on coal- and natural gas-fired generation and imports of electricity from Canada or New York because of the recent retirement of two large generators: the 744 megawatt (MW) Salem Harbor coal- and oil-fired plant in Massachusetts, which retired in June 2014, and the 604-MW Vermont Yankee nuclear facility in Vermont, which permanently shut down on December 29, 2014. NERC's Winter Assessment points out that some supply issues that became apparent after last winter have not yet been resolved for the upcoming winter. Coal stockpiles are slowly recovering from last winter, but they remain low in certain locations. The amount of natural gas pipeline capacity into New England is unchanged from last year, although the region's system operator has developed some short-term solutions to address the potential for extreme-weather natural gas supply constraints, such as ensuring that dual-fired generating units have adequate access to supplies of alternative fuels. Grid operators in other regions (ERCOT, MISO, and PJM) have also taken steps to improve their cold-weather preparedness by improving coordination between the electric and natural gas industries. Additionally, in a recent order the Federal Energy Regulatory Commission required independent system operators and regional transmission organizations to file reports outlining their efforts to address generator fuel assurance issues.